Elsie works closely with her brides providing a personalised service. She loves collaborating and sharing ideas with clients to find the perfect bridal makeup+hair look for you. Her calming presence, warm sense of humour, creativity and expertise allows you to be completely at ease and enjoy your special day knowing that you will look like the most beautiful and radiant version of yourself. 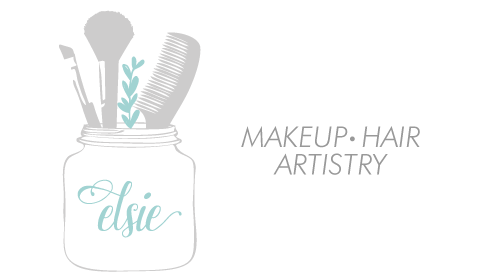 Elsie provides a mobile makeup+hair service. Please let her know your location when enquiring on availability. Have a large bridal party? Not to worry! Elsie works with a team of qualified makeup+hair artists, please give plenty of notice when booking so the necessary arrangements can be made. Elsie does location + travel weddings and photo shoots as well. Please contact her for further details. Whether it’s your engagement party, formal ball, or special night out, let Elsie use all her trade secrets and skills to create that spectacular makeup+hair look for your next special occasion. With her extensive portfolio and range of clients, Elsie brings the necessary experience to your shoots. She is available for advertising, editorials, portraits and commercial shoots. Contact Elsie today to check on availability and prices!